15/1/08 - Leigh-on-Sea to London Fenchurch Street. London Marylebone to Birmingham Snow Hill. Birmingham Snow Hill to Stourbridge Junction. Stourbridge Junction to Birmingham Moor Street. Birmingham New Street to Redditch and return. Birmingham New Street to Rugeley Trent Valley. Rugeley Trent Valley to Stoke. Stoke to Stockport. The journey to Birmingham went smoothly despite having to cross London by tube in the rush hour. I made it to Marylebone with ten minutes to spare. I always find travelling on Chiltern trains a pleasant and laid back experience. They go at their own pace and don't rush like hell for leather as with Virgin, which I find relaxing. I found a gem in Dorridge station, which must rank up there as one of the best looking stations in England.? As the train arrived at Snow Hill at least five minutes earlier I was able to get my West Midlands Day Ranger (which the ticket clerk didn't know anything about and had to ring up someone for advice!) and still get the train I was hoping to catch with just two minutes change over originally. The only problem was that when I got to Stourbridge Junction the new train bus "people carrier" to Stourbridge Town was still not up and running, so instead they had a bus shuttle - actually a 50 seater coach. I worked it out that I could still travel to Stourbridge Town and back and still get my train to Worcester, before heading back into Birmingham via Bromsgrove to travel on the Redditch branch. About five of us went to the stop and a coach arrived within a couple of minutes and one person then got off, but for some strange reason the coach driver shut the door and pulled away. There was another coach waiting in the car park and that soon moved over to the bus stop and we got on that. Meanwhile another train had come into the station and one more passenger got on our coach. I should have listened to my better judgment and got off then, but did get up to ask the driver when we would be going and he said "now", so I stayed on and we duly went the ? mile to Stourbridge Town station. I got off, took a couple of pictures, expecting the driver to get going again, but there was a sign which said 15 minute service, which wasn't on display at Stourbridge Junction, so I started to walk back, trying hard to remember the route by which we had come. Of course in spite of walking as quickly as I could, I missed the train I should have got by two minutes! So a change of plan was needed and rather than wait for the next train to Worcester, I decided to go back into Birmingham and continue my journey to Redditch from New Street rather than University. I got off at Birmingham Moor Street, which must be one of the nicest mainline stations around, tastefully restored with its GWR brown colour scheme and original station names, plus a GWR steam engine parked in one of its bay platforms. I then walked the few hundred yards to New Street station and came to what is one of the worst mainline stations in Britain. Going from heaven to hell if you like! Anyway I got a train to Redditch half an hour earlier than I was going to and so arrived back at BNS ahead of schedule. I was originally going to stay on the train all the way to Lichfield TV and then get a London Midland train to Stoke and then one to Stockport. Instead I decided to get a fast one to Rugeley Trent Valley and pick the train up there. Big mistake. It would mean waiting around 40 minutes there, so hopefully I could get a cup of tea or even walk around the place. When I got there it was just two basic shelters and no buffet and all these express trains roaring through. In reality it was rather like a country station but only on the WCML. I should have got off at Rugeley Town instead and gone round the shops there. So rather than hanging around I decided to take a walk and see what signs of life there were in this hamlet. Not much. I saw a pub at the bottom of the lane, but it had been converted into a restaurant and wouldn't be open until 6. There were a few terraced houses and factories - rather like Thorpe-le-Soken, near Clacton. So there was nothing to it, but to go back to the station and duly wait. Only when I got there the train was delayed by ten minutes and so wouldn't be there until just before 5. So as I had arrived there at just after 4, it was rather a long wait. Good job it wasn't the next train an hour later. That was cancelled altogether and replaced by a bus. So I got to Stoke about 15 minutes later than planned, just as a train to Manchester should be coming in. In fact this was delayed another half hour, so it ended up with three trains all going to Manchester - all within five minutes of each other - just like buses! I took the first one, which was a Virgin one and very cramped after the spacious London Midland units that I had travelled on. Whilst waiting at Stoke the Royal Train pulled into the station on the passing line and waited at a red right. I managed to get a picture and no one came to arrest me so presumably there weren't any royals on board and it was just empty coaches. Still, I got to Stockport about half an hour later than planned. Better late than never. Roll on tomorrow and the rare once a week train from Stockport to Stalybridge, plus three more branch lines to travel on. 16/1/09 Stockport to Stalybridge via Guide Bridge. Stalybridge to Manchester Victoria. Manchester Victoria to Rochdale via Oldham. Rochdale to Hebden Bridge. Hebden Bridge to Burnley Manchester Road. Burnley Barracks to Colne. Colne to Blackburn. Blackburn to Clitheroe and return. Blackburn to Bolton. Bolton to Wigan Wallgate. Wigan Wallgate to Manchester Victoria via Swinton. Manchester Piccadilly to Stockport.?? He plan was to do several branches in Manchester and Lancashire using a Lancashire Day Ranger ticket fro ?18. It was certainly a busy day, which wasn't helped by the bad start to the day. I should have got the 09.22 once a week "Ghost train" from Stockport to Stalybridge, but due to the driver getting on the wrong train at Manchester Piccadilly, we ended up not leaving until 10.05. Still I had a good chat with my two other fellow passengers and the guard and got to visit the famous station buffet at Stalybridge. It meant that I was an hour behind schedule and would have to abandon my plans to go on the Rose Hill branch at the end of the day. Nor would I be able to go to Liverpool and back via Wigan tomorrow. So I got into Manchester Victoria a few minutes earlier than scheduled and decided to take a risk going via Oldham to Rochdale, rather than getting a later more direct train to Rochdale. On the way there was delay at Shaw? and I thought oh no another hour's delay but we got into Rochdale a couple of minutes early and I could see my connection waiting on the other platform, so rushed over to it to see the doors shut and the train starting to pull away! Good job I didn't get on as this was the returning Rochdale train to Manchester via Oldham, but the station sign had said it was the Leeds train. So panic over and I duly got on the next train and got off at Hebden Bridge. It's a nice line and a nice station still having its original pre-BR signs, plus a nice buffet where I bought a freshly made sandwich for my journey. The next problem was going to be at Burnley Manchester Road. Thanks to Northern Trains timetable if I want to go to Colne from the east, I can't get a connection to the Blackpool South to Colne train at Rose Grove as the westbound trains don't stop there. The first stop is Accrington and then it's a three quarter hour wait. So I decided that the nine minutes gap between Burnley MR and Rose Grove or twelve minutes between Burnley MR and Burnley Barracks should be enough, especially if I took a cab. Of course the train was couple of minutes late arriving at Burnley MR and there were taxis to be seen, so in a repeat of yesterday's Stourbridge Town fiasco, took to my feet and half jogged to Burnley Barracks. I got there with two minutes to spare, but after waiting over five minutes, began to think that I had missed my connection. But the train did arrive and I duly travelled on this branch and back to Blackburn where I had to face more delays. Due to a "signal problem" in the Salford area, my train to Clitheroe was over ten minutes late. Not too much of a problem, but by the time I had travelled to Clitheroe and back and then stayed on to Bolton, my connections to Wigan were all up the creek. Still I was able to see Northern Trains newly liveried Adelente train going from Blackpool North to Manchester Victoria. This signal problem had put all the trains out of Manchester Victoria up the creek and so when the first train to Wigan Wallgate came in, it was just a 2-car unit, full to the brim. I refused to get on it and waited for the next one, which should have only been 15 minutes, but was in fact half an hour. So just to cover some new track I went to Wigan Wallgate and came back to Manchester Victoria via the Swinton line, eventually getting back to Stockport at around half seven instead of half six. No wonder I went to bed at 10 o'clock! 17/1/09 Stockport to Manchester Piccadilly. Manchester Piccadilly to Guide Bridge. Guide Bridge to Rose Hill. Rose Hill to Romiley. Romiley to Manchester Piccadilly via Reddish North. Manchester Piccadilly to Eccles (Metrolink). Eccles to Cornbrook (Metrolink). Cornbrook to Altrincham (Metrolink). Altrincham to Stockport. Stockport to London Euston. London Fenchurch Street to Leigh-on-Sea. Had a bit of a lie-in compared to yesterday and made a leisurely trip from Stockport to Manchester Piccadilly, where I caught a train out to Guide Bridge, where I was able to take some pictures. Then got one to Rose Hill, which I found quite a pleasant area and station. On the way back, I got off at the first station, Romiley, where I could catch a quicker train back to Piccadilly, via Reddish North. As soon as I got off my train, the station display board said that the train I had just got off was the one I intended to get! Yet again, there seemed to be a glitch with the timings of trains and display boards. Once back at Piccadilly I went on a tram trip to Eccles to complete all of the Manchester Metrolink lines. It seemed to go quite slowly through the Salford Docks area, but did speed up towards Eccles. I decided to get a train back into Manchester, rather than going back the way I had come, but after a ten minutes walk to Eccles railway station, there was no display sign or information to say when the next train would arrive. When I asked at the ticket office when the next train would be, I was told " in about ? of an hour!" So it was back to the tram stop and the way I had come. Would I be able to get to Altrincham on time to catch my hourly train from there to Stockport? In fact I made it with about twenty minutes to spare, giving me time to find a toilet and get a sandwich. The train from Chester was on time and I duly covered my final piece of railway track in Manchester. Although it doesn't have much (if any?) freight any more, this is another line that could be developed, especially as it passes through Wythenshaw, which doesn't have a railway station. Maybe it could be converted into a tramline and trains for Chester could terminate at Altrincham? Anyway I made it to the Stockport - Southend match, which was marred by trouble between the Stockport stewards and some Southend fans, arguing about standing up/sitting down. I then got back to Stockport station, only to be told that by train was delayed by 10 minutes. It did come and as usual (on Virgin trains), my seat reservation didn't exist, but I did get a seat with table to myself for the whole journey back to Euston. The one problem was that the heating was on high and by the time I got to Euston, I was actually feeling sick and was glad to get into the fresh air, the first time this has ever happened to me in all my years of train travel. But what a couple of days, meeting some very friendly people compared to "down South" and travelling over plenty of new track. 21/1/09 - Leigh on Sea to Fenchurch Street and return. London Blackfriars to Wimbledon. Wimbledon to Epsom. Epsom to Sutton. Suttion to London Victoria.? On the way back was able to take some photos at Fenchurch Street, Barking and Upminster stations, as I am currently writing a feature on the London, Tilbury and Southend line to be published in Railway Magazine this year. 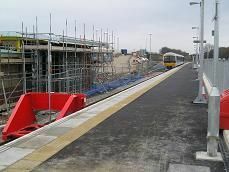 The building site at Aylesbury Vale Parkway railway station. 2/2/09 - Leigh-on-Sea to Barking. Barking to Upminster. Upminster to Romford and return. Upminster to Leigh-on-Sea. Had to go to both Barking and Romford with my work and what better way to go in the snow than by train. In spite of all the snow and freezing conditions I didn't have to wait more than five minutes for a train at any of the stations I visited! 7/2/09 - Leigh-on-Sea to London Fenchurch Street and return. London Euston to Birmingham New Street and return. Birmingham Moor Street to Bordersley and return. Went to Birmingham to see the Birmingham City versus Burnley match - another ground to add to my list. Interesting to see the snow covering between Watford and Rugby. Still on the platforms and in the car parks, whilst in Leigh it had all gone! Didn't have time to go on any other lines, but got a train out of Birmingham to the little used Bordersley station, which must rank as one of the most run down stations in Britain, alongside Reddish South! On the way up, my train was cancelled from Euston, but got an earlier one, which left about fifteen minutes earlier. No problems coming home apart from a delay at Rugby, making my train fifteen minutes late into Euston. Kind of equalled things out. 17/2/09 - Leigh-on-Sea to London Fenchurch Street and return. London Marylebone to Harrow-on-the-Hill. Harrow-on-the-Hill to Amersham (Metropolirtan line train). Amersham to Aylesbury Vale Parkway. Aylesbury Vale Parkway to Ayelsbury. Aylesbury to Princes Risborough. Princes Risborough to London Marylebone. London Victoria to Clapham Junction. Clapham Junction to Balham. Balham to Sydenham Hill and return. Made a first visit to Aylesbury Vale Parkway, which I had been meaning to do for some weeks. It turned out I was the only passenger arriving and departing there! It is still very much a building site and seems to be in the middle of nowhere, though I am sure it will become more popular. Coming back I was hoping to get the 16.56 from Sydenham Hill to Tulse Hill covering that small section of track. However when I got to Victoria trains were being cancelled and delayed all over the place. This was due to a suicide at Balham earlier in the day. I did get to Sydenham Hill with about twenty minutes to spare and went out and bought a cup of tea. When I got back my train had been cancelled due to stock being all over the place, so will have to do it another day. 13/3/09 Leigh-on-Sea to London Fenchurch Street. London Paddington to Gloucester. Gloucester to Newport. Newport to Cheltenham. Cheltenham to Worcester Foregate Street. My first big trip on Britain's railways for two months. Primarily to see Southend United play away at Hereford, but also to cover some new lines around Gloucester and in the Birmingham area. It's several years since I left on a mainline train from Paddington, so I'm quite excited as I come up the escalator and see the large shed roof of Paddington. There's an Adelente in platform 1 and I wonder whether this could be my train, but it leaves soon after ECS to go to Old Oak Common. In the end my train departs from platform 9 and is a HST. I'm in coach A - the quiet coach and as soon as we leave Paddington a woman answers her phone. Almost immediately another woman gets up and tells her this is a quiet coach, so she hurriedly ends her call. After that it's pretty quiet all the way to Gloucester... and relaxing. Swindon onwards is new track for me and as soon as we get to Kemble, you get that old GWR feeling with the station architecture on this line, which is original Victorian. We arrive at Gloucester about five minutes early, so I buy my ticket to Worcester - I already have my return to Newport - and explore the station. The platform I get off at - platform 2 is also platform 1, as the platform is designed to take two different trains at once. It brings back a conversation I had the other week with a friend about Colchester station. He said it has the longest platform in Britain. I said it is Manchester Victoria. Perhaps it is Gloucester? After about ten minutes my Arriva Trains Wales train comes in and I take a pleasant journey along the west bank of the River Severn to Newport and back. I did debate going back via Bristol to cover another bit of track, as my ticket said "via any route", but when I looked at the times it wasn't worth the risk. The temptation to do this was that when I got back to Gloucester I would miss a connecting train to Worcester by about five minutes and then there wasn't another one for over 1 1/2 hours. In the end I spent less than ten minutes at Newport and got on a Cross Country train going to Nottingham. I decided to stay on it as far as Cheltenham as there might be a better connection for Worcester there. Plus I could always walk round the town if not. When I got to Cheltenham the races was on so there was extra security there and no way that I could get out of the station on the ticket I had. But luckily the train I missed by five minutes at Gloucester had been delayed, so it only meant a five minutes wait at Cheltenham and I got into Worcester about an hour earlier than expected. It's the first time I've been to Worcester by train since 1978, so it was rather depressing to see all the overgrown sidings there. But it is still semaphore country. At Shrub Hill we wait for ages - about ten minutes actually before going through to Foregate Street. Later I find out that trains usually wait fro 20 minutes here. Why? I don't know. The train I get off has come from Bristol Temple Meads, but it's going back to Weymouth via Swindon, Melksham and Westbury. Quite an usual journey if you ever get the chance. 14/3/09 Worcester Shrub Hill to Birmingham Moor Street. Birmingham New Street to Lichfield Trent Valley. Lichfield Trent Valley to Nuneaton. Nuneaton to Coventry. Coventry to Birmingham New Street. Birmingham New Street to Hereford. Hereford to Worcester Foregate Street. After yesterday's strike by London Midland train staff I was little concerned that the trains I was catching today might be disrupted due to stock not being in the right place, especially the Trent Valley stretch, but everything was running as normal. Started the day at Worcester Shrub Hill, which sadly is only a shell of what it used to be in Great Western days. Still there's plenty of semaphore signals in place and it has two unusual bay platforms. On the way we pass through Kidderminster, which I believe is the first time I have ever visited the place. It's great to see all the Severn Valley Railway stuff from the train including a beloved Warship, which I managed to catch on my camera. I make a mental note to visit this railway soon. The Birmingham to Lichfield stretch is pretty uneventful apart from the fact that I seem to be the only person in the carriage and possibly the while train! At Lichfield Trent Valley I need to go to the loo, but there doesn't seem to be any signs of them on the platform. Luckily they have them in the tiny ticket office/come waiting room, though you have to get a key from the ticket office first. This done I wait for almost half an hour on the open platform as Virgin Pendelinos thunder past. Still, its better waiting here than at Rugeley Trent Valley, as I had to the other week for well over an hour. There is a nice stone "monument" behind me to when the station was rebuilt in 1987. The Trent Valley train is on time and it's a smooth and fairly quick ride to Nuneaton, which has plenty of character. The train to Coventry arrives as soon as I get off the train, but I have time to get a cup of tea and some sandwiches at the pleasant station buffet on platform 1. In the buffet there's even a section dedicated to railway enthusiasts, with old copies of Railway Magazine for you to look at, or various train paintings on the wall. We leave on time, but I didn't expect the train to go south out of the station, so have to promptly change seat direction! The section between Nuneaton and Coventry is OK, but could do with extending through to Leamington perhaps. At Coventry I'm in time to catch the Wrexham and train coming through, but blow my photo opportunity, taking the photo just a couple of seconds too early. Then it's another London Midland train back to Birmingham New Street. Someone needs to let them know that they've got their train announcements out of synch though. As we leave a station, the announcement tells us that we are approaching the next station. Eg. "We are now approaching Birmingham New Street, Please etc, etc", yet we are only leaving Adderley Park. The journey to Hereford was uneventful apart from an irritating boy sitting next to me who couldn't sit still and was constantly being told off by his dad. I did notice that the semaphore signals around Worcester all go down to let a train through, which I believe is the old Great Western way. I enjoyed the scenery around Malvern - a mini-lake District if you like, but why did they have to bore a tunnel through the middle of it, rather than going round? - would've been much cheaper. On the way back sat with one Southend United fan (from Penzance but going to Birmingham to see Villa play Spurs the next day) and two Hereford fans. We got on very well talking about all things football. 15/3/09 Worcester Shrub Hill to London Paddington via Oxford. London Fenchurch Street to Leigh-on-Sea. It's a nice sunny day to take a trip down the Cotswold Line, which I haven't been on since 1978. I'm expecting another HST, but in fact it's a tiny 3-car class 166 DMU. It's quiet enough when I get on, but it soon fills up with England rugby fans going to Twickenham and Chelsea fans (even from Evesham!) going to Stamford Bridge. By Moreton-in-the Marsh it's standing room only. If only they had put on an Adelante? Don't the powers that be ever think that on some days when there's a major sporting event on in London that more carriages might be needed? Well someone must have been thinking my thoughts as at Oxford a further two carriages are added to the train to relieve the overcrowding. At Honeybourne I miss the junction for Long Marston and at Moreton-in-the-Marsh, we have a five-minute wait, whilst at Oxford it is more like 15 minutes. We pass Didcot Railway Centre, which looks pretty quiet. I have heard rumours that bit is closing down, so that might explain why it is so quiet. After just missing a train at Fenchurch Street, I have to wait another half hour for one. I finally reach Leigh-on-Sea at 2 o'clock, almost five hours since leaving Worcester. 28/3/09 St Albans to Luton Airport Parkway. Luton Airport Parkway to Leicester. Leicester to Chesterfield. Chesterfield to Derby. Derby to Leicester. Leicester to Luton Airport Parkway. Luton Airport Parkway to St Albans. Went to see Chesterfield versus Port Vale as part of my "Doing the 92", visiting all the 92 football league grounds. This was number sixty. Rather than go into London and out again by train, it was quicker and cheaper to drive round the M25 to St Albans and catch the train from there. But it meant two changes to get to Chesterfield. Got to St Albans in exactly an hour. Paid my £2 parking fee for a space in a pretty empty car park and then tried to get onto the station from the entrance by the car park, but the ticket barrier wouldn't accept my ticket. So walked up the steps and over the bridge and went in the main entrance where again the ticket barrier wouldn't accept my ticket. This time there was a man there who waved me through the barrier, not bothering to check my ticket. Decided to get an earlier train to LAP as on Tuesday I noticed a 1stCapital Connect train cancelled at London Bridge and at St Albans a St Pancras train had been cancelled. Got to LAP with half an hour wait before my train to Leicester would come in. The only car park I could see was empty apart from a load of builders waste! Didn't see any signs for a buffet - just a waiting room and coffee/tea machine. Decided to try my luck with that and put a pound coin in and pressed the picture of the drink that I wanted, but nothing happened. Saw a message saying press the drink you want. In my frustration I pressed about four different choices and eventually the machine started working. Tea came out, but it had sugar in it - saccharine actually, so naturally I spat it out at first taste! I then took a picture of an East Midlands train- I quite like their livery - before going over the bridge to my platform. Once I had crossed over the bridge there was a stylish station cafe and toilets, with a great view of the track to the south. Pity about the signage. Could've had a decent cup of tea at a table. My train to Leicester (going onto Nottingham) was on time - a 5 car unit which was pretty empty and guess what there was someone in my reserved seat yet again, but I got a seat with a table so it was OK. The train stopped at Bedford, where I could have changed trains I suppose. Then Wellingborough, which is on a curve at an angle. Just after Wellingborough where they are quadrupling the track, we passed a railway worker driving his car along the newly laid ballast! Then further up there was another car, parked by some men working. We also stopped at Kettering and Market Harborough, before arriving at Leicester. It was a semi-fast train, but I would say quite slow, never going faster then 60mph. At Leicester I got on an express train to Chesterfield, stopping the once at Derby. Coming back the Class 222 unit had some sort of problem so we had to change trains at Derby, but it didn't hold us up too much. Waiting at Luton Airport Parkway on platform 1, they could have done with some enclosed waiting rooms, as it was pretty windy and cold. All you got was a four-seated cubicle type thing. Anyway got back to St Albans on time, but then had an hour's drive, which was quite tiring after such a long day. 6/4/09 Liverpool Central to Birkenhead North. Birkenhead North to New Brighton. New Brighton to Liverpool Central. On holiday on our way to the Lake District, stopped off in the Liverpool. Whilst my wife went shopping I went over to New Brighton on the Merseyrail to cover one section of track between Wallasey Grove Road and New Brighton, which I hadn't done all those years ago, when I lived up here. A nice sunny day and a pleasant line and stations on this route. 11/4/09 Manchester Victoria to Wigan Wallgate via Bolton and return. On our way back from the Lake District we stayed two nights in Manchester. I was originally going to see Man City play Fulham, but the match was moved from the Saturday to the Sunday. Instead I chose Wigan versus Arsenal and got the train out of Manchester to Wigan. No problems apart from the fact that I had to leave the game early to meet my wife back in Manchester. Just made it with two minutes to spare at Wallgate. 12/4/09 Manchester Piccadilly to Glossop/Hadfield and return. Manchester Piccadilly to Manchester Oxford Road. For Easter Sunday we decided to go walking in the Peak District. We were originally going to catch a Sheffield train as far as Edale and walk some of the Pennine Way, but as trains are only every two hours it was practicable. Instead we caught a train to Hadfield via Glossop, which are every half hour - much more accommodating. We then walked along the first part of the Woodhead route, along the Longendale route past the reservoirs. We used a Wayfarer ticket, which was better value than a cheap day return as it included travelling on the trams. The only problem was that the tramlines were closed in the centre of Manchester, so we had to walk from St Peter's Square to Piccadilly going. Coming back we so tired that we caught a train to Oxford Road and then a bus to the G-Mex tram stop. 25/4/09 Leigh-on-Sea to London Fenchurch Street and return. London Euston to Stafford. Stafford to Manchester Piccadilly. Manchester Victoria to Oldham Werneth and return. Manchester Piccadilly to London Euston. A fortnight later and I'm back in Manchester once again! This time to see Southend United's final away game of the season at Oldham. A pleasant day out, even if I nearly missed my connecting Cross Country train at Stafford, due to a delay. Still it waited for us. Couldn't see any sign of Norton Bridge station this time. It was weird walking through the centre of Manchester along the tram lines which were not being used due to upgrading of the section in the city centre. Came back via Crewe which was unusual but saw loads of locos stabled in the sidings south of the station including the original Class 47, North Star. 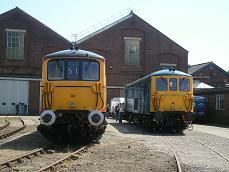 Two Class 73's at Eastleigh Works Open Day. Yes there were plenty of people there. I was just lucky to get this shot! Would you believe my first outing on a train this month! Went to visit Wembley Stadium for the first time since it was rebuilt by going to the Cambridge-Torquay play off final. Went as a neutral but went in the Torquay section which was the right decision! 20/5/09 - Leigh-on-Sea to London Fenchurch Street and return. London Cannon Street to Beckenham Junction. Beckenham Junction to St Pancras International. Made this journey specifically to go on the curve from New Beckenham to Beckenham Junction which only happens on the 09.24 from Cannon Street. Also came back via Blackfriars to see how work is progressing. I can't believe that it's going to take them till 2011 to complete the work. Looks like they've done quite a lot already. Also got off at the new St Pancras International station on the Thameslink line, which is quite bright for an underground station. Where you get off means that you are on the lower level so you could quite easily miss all the nice statutes and roof of the station, visible only from the upper level. Noticed that they had trains running through to Corby. Will go on this line, once trains run beyond Corby to Oakham and Melton Mowbray. 25/5/09 - Leigh-on-Sea to London Fenchurch Street and return. London Victoria to Southampton via Barnham. Southampton to Eastleigh. Eastleigh to Clapham Junction. Clapham Junction to London Victoria. Went with my friend Mark to the final day of the Eastleigh 100 event. Went on Southern trains from Victoria to Southampton via Barnham as they do a very good deal on a rover ticket for anywhere on the Southern network for just a pound. But came back on South West Trains via Woking because of the need to get back home quicker than going. Mind you we were able to upgrade to 1st Class for just a fiver. The event was very well organised with beautiful, hot weather and no thunderstorms as forecast. There were plenty of diesels and electric locos and units, plus some Southern Region steam locos, though not as many of the latter as I was expecting. Also plenty of stalls in the big shed, plus real ale on tap for just £2.50 a pint! 3/6/09 - Leigh-on-Sea to London Fenchurch Street and return. London Cannon Street to Beckenham Junction. Beckenham Junction to Herne Hill. Herne Hill to London St Pancras. Had a meeting in London in the afternoon so used my day to go on the rare train that goes between New Beckenham and Beckenham Junction. 20/6/09 - Leigh-on-Sea to London Fenchurch Street. London Marylebone to Thame Bridge Parkway. Thame Bridge Parkway to Rugeley Trent Valley. Rugeley Trent Valley to Birmingham New Street. Birmingham Moor Street to Stourbridge Junction. Stourbridge Junction to Stourbridge Town and return. Stourbridge Junction to Shirley. Shirley to Stratford-upon-Avon. Stratford-upon-Avon to Leamington Spa. Leamington Spa to London Marylebone. Off to Birmingham for the day to complete all the branch lines in the area. It meant a very early start - up at 5.45 am to catch the 6.21 am train from Leigh-on-Sea into London and then the 8.14 am Wrexham and Shropshire from Marylebone to Thame Bridge Parkway. I'm surprised at the number of passengers about for such an early train. There are at least 10 passengers at Leigh - all single males for some reason. Once I am on the train it is over half full. Then at Basildon around 40 people get on. By the time it gets to Fenchurch Street it is actually full with standing room only. At Marylebone it's pretty quiet and the platform number for my train is not showing, but I can see the train waiting at Platform 4. So I take my paper ticket (downloaded from the internet - cost just £9.00) to the barrier expecting it to scan in where the Oyster cards go, but it doesn't work, so the ticket guard has to manually scan it and then open the barriers for me. Must keep him busy if most W&S passengers have bought their tickets this way! I stroll down the platform and take some photos of the train, by which time the doors are opened and I am the first on the train. It's nice to go back in time and be on a train with Mark III stock, but it does look a bit dated inside and most of the seats do look worn. Plus it's irritating when you can't lift up the arm rest in the middle to get in and out of your seat. There are no seat reservation tickets, so I swap seats as I have been given a seat going backwards ,which I hate. By the time we leave, two minutes late - due to a couple of late stragglers - the train is only about ¼ full, so it's easy to find a seat with a table. Straight away a female guard arrives to check our tickets. The train moves very smoothly out of the station and does a steady 60 mph once we are out of London. We get to High Wycombe within the half hour, so surely we must have to go very slowly or stop somewhere before the first scheduled stop at Thame Bridge Parkway at 10.44. Well actually that was what the train indicator sign at Marylebone said, but we do actually stop at Banbury to pick up only. The train only goes about 50 mph between High Wycombe and Bicester, but after Bicester it actually reaches 70 mph. Then we come to a complete stop at Ayniho Park Junction to allow a Cross Country train from the Oxford line to pass before us. It's then stop and start until we come into Banbury on time. I notice that the staff all move to the doors to "stop" anyone getting off. About five passengers do get on though and we leave very smoothly once again. At Leamington Spa we turn right to go to Coventry, where we are held up for about 10 minutes until a path becomes clear. We do arrive at Thame Bridge Parkway on time, though it's raining by now. It's only a five minute wait before my train to Rugeley TV comes in, though it's not a nice LM Class 170 unit, but a boring west Midland Class 150. That part of the journey goes OK and I get into Birmingham on time, changing from New Street to Moor Street with ease. I then get another Class 150 and go to Stourbridge Junction where I finally make it along Britain's shortest branch line on the new Parry People Movers. The jury's out on whether they're better than the Class 150 bubble cars for this line. Then it's back into Birmingham and out to Stratford-upon-Avon for more new track. I'm glad to see that they've kept three platforms there, so excursion trains can visit the town. Finally it's out via Hatton and Leamington Spa and back to London. 24/6/09 - Leigh-on-Sea to London Fenchurch Street and return. London Waterloo to Clapham Junction. Clapham Junction to Feltham via Hounslow. Feltham to Staines. Staines to Windsor & Eton Riverside. Winsdsor & Eton Riverside to London Waterloo. Went on this route again partly to cover the Hounslow Loop and partly to get some photos of Staines station for the Windsor branch. Once again the SWTrains I get are all 8 carriages, but reasonably full, especially of young people going to Thorpe Park who get off at Staines. Also at Windsor a lot of people also get off, showing that it is a popular tourist destination in the summer. 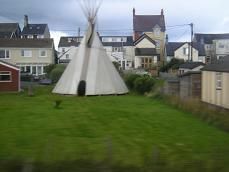 Yes it really is an Indian Tepee next to Borth railway station! I was originally going to travel the whole of Wales via railway over four days with a Freedom of Wales ticket, but family commitments put paid to that. Probably a blessing in disguise as it would be quite exhausting to do the whole of Wales in that time. Instead I've compromised and am doing just North Wales instead - in just two days - staying overnight in Shrewsbury and Chester. Chose to go with Wrexham & Shropshire again - much more relaxing than Virgin and only £10 all the way from London to Shrewsbury. This time the train is about 90% full, but has exactly the same coaches and serving lady in the buffet. No problems on the journey and it is much quicker, not being held up outside Coventry for 10 minutes like last time. I sit next to a German lady who lives in Walsall and is very friendly, so much so that she asks to use my mobile phone to ring for a taxi! She does pay me of course. It's the first time since the 1970's that I have been on the Wolverhampton to Shrewsbury line, so it's interesting to see how much Telford has grown. 24/7/09 - Shrewsbury to Aberystwyth. Aberystwyth to Machynlleth. Machynlleth to Pwlheli. Bangor to Holyhead. Holyhead to Chester. Start the day by getting the 07.27 from Shrewsbury to Aberystwyth, which is about half full. It's a pleasant journey which starts with a clear sunny sky in Shrewsbury, but by the time we reach Machynlleth, it's pouring down. It's sunny again by Dovey Junction, which like Berney Arms has no road access and is one of the most isolated stations in Britain. It doesn't seem to have an exit and I can't see any road leading to it. I can't really see why it is still open, as if you change trains there, there are no facilities apart from a shelter. You would be better changing at Machynlleth, where there are toilets and a buffet. Anyway, we get to Aberystwyth a full ten minutes early, so I have time to go out of the station and take some photos. It should have been just a four minute turnaround. When I get back the train is about ¾ full and I can't get a seat with a table. By the time we reach Machynlleth, it's raining again! I now have a fifty minute wait before I can get my train to Pwhelli. Good job I didn't change at Dovey Junction! I go into the town and have a cup of tea at a cafe. When I get back the Aberystwyth train is ten minutes late, which makes the Pwlheli train late as well. 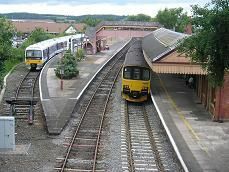 The Aberystwyth train has four carriages, which split at Machynlleth. Two go off to Aberystwyth, whilst two go back to the sidings. Then two more come out form the sidings to form the Pwlheli train. Very strange! There are at least fifty people waiting to get on my train, so it is pretty full by the time we eventually get going. Quite a few get off at Aberdovey, but after Barmouth its so full, many people have to stand. You would think a four car train would be more practical in the summer holiday season. It's the first time I've been to this region since I was a boy, so it's intertsing to see this area again, with the beautiful views. After Portmadog, the train is pretty empty again, and like Aberystwyth, we arrive in Pwlheli a full ten minutes ahead of schedule. I then have a wait of over half an hour before I get a bus to Caernarvon and then another one to Bangor. I have a cup of tea in the buffet at Bangor, before getting a train to Holyhead, which is new track for me. The station is now much smaller than in the past, with just one platform in use, with another outside the main part for excursion trains presumably. I then have a twenty minute wait before taking the same train all the way back to Chester, which is where I grew up. 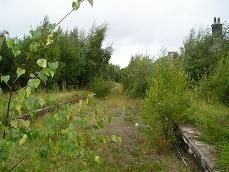 sadly the station area has been neglected over the years, with weeds growing on the tracks and even a tree growing on one platform. The gents toilet is disgusting and filthy and should have been replaced years ago. 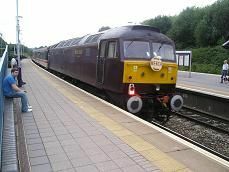 24/7/09 - Chester to Llandudno Junction. Llandudno Junction to Blaneau Festiniog and return. Llandudno Junction to Llandudno and return. Llandudno Junction to Chester. Chester to Birkenhead Hamilton Square. Birkenhead Hamilton Square to Bidston. Bidston to Wrexham Central. Wrexham General to Shrewsbury. Shrewsbury to Birmingham International. Birmingham International to London Euston. London Fenchurch Street to Leigh-on-Sea. Get up well before 6.00am to walk to the station, arriving five minutes before getting the 06.44 Virgin Train from Birmingham New Street to Holyhead. I am one of only a handful of people on it, but the buffet is open, so I buy some breakfast. I get this early train so I can make the train from Llandudno Junction to Bleaneau Festiniog. I am only one of three on the train and have the whole of the first carriage to myself. It's a pleasant journey and one I haven't done since the early 1970's. Very much a mountain railway with impressive scenery to match, though Blaneau Festiniog still looks very grey with all its slate mountains and low cloud. Coming back I am able to make my connection to Llandudno and back and then get the 10.23 from Holyhead to Birmingham New Street, though its running about five minutes late and by the time we reach Chester, I have just over five minutes to make my connection for the Birkenhead train. I still have time to buy my ticket to Bidston, before getting the 11.30 Chester to Liverpool train, which is a few minutes late anyway. This is a journey I did six days a week for seven years in the 1970's going to school in Birkenhead, so it was interesting to see how it had changed. My biggest disappointment was that just after Rock Ferry, there used to be one of the best skyline views in the world across the Mersey to Liverpool, but sadly the track has been left to decay here and bushes and trees now spoil the view. Then it was onto Bidston and a trip down the Borderlands line, a journey I never made in the 70's, although it was on my doorstep. Again slightly disappointing from the view of the line looking like it has been neglected and could be upgraded with a little effort. Then it was down to Shrewsbury to visit the new Shrewsbury stadium for the friendly match between Shrewsbury and Leicester City. I got a taxi there for £6.80, but got a bus back for just £1 20! On the train back to Birmingham International, I sat opposite a Leicester fan who had been to all ninety-two league grounds and shared some interesting stories. Having to change at Birmingham International I had a quick explore and was pleasantly surprised with the waiting area, which was upstairs and had nice settees and coffee tables, giving it a relaxed and pleasant atmosphere, unlike some of the other waiting rooms I've been stuck in over the years. 27/7/09 - Leigh-on-Sea to Fenchurch Street and return. Highbury & Islington to Moorgate. 22/8/09 - Cardiff Central to Bridgend via Barry. Bridgend to Maesteg. Maesteg to Cardiff Central. Cardiff Central to Cardiff Queen Street and return. Cardiff Queen Street to Cardiff Bay and return. Cardiff Central to Filton Abbey Wood and return. I was in Cardiff for the weekend to see U2 play at the Millennium Stadium on the Saturday night, but as I had arrived on the Friday night was able to cover some new lines in the South Wales area. I chose to go first to Bridgend via Barry and then onto Maesteg before coming back to Cardiff on the mainline. Passing Canton I noticed a class 50 being done up and also a Scottish Class 26 hidden in all the stock. I had also some time to fit in a trip in the Bubble car on the Cardiff Bay Line, before going over to Bristol to see the Bristol Rovers versus Huddersfield match in the afternoon, before returning to Cardiff for the U2 gig. Got off at Filton Abbey Wood. Isn't the station there like a maze with all those sloping walkways? Met a few enthusiasts on the platform after the match, waiting for the Nenta Tours special coming from Cardiff to Bristol. I managed to catch it too - see photo. Obviously I will return again to do the Valley lines and all the lines west of Swansea - hopefully in the next year. 27/8/09 Leigh-on-Sea to London Fenchurch Street and return. After about twenty years of seeing the Tower of London every time I got off the train at Fenchurch Street, I finally visited the damn thing! 31/8/09 - Leigh-on-Sea to Grays and return. Went to the Grays versus AFC Wimbledon match at Grays. 3/9/09 Leigh-on-Sea to London Fenchurch Street. London St Pancras to Sheffield. Sheffield to Doncaster. Doncaster to York. I was supposed to go up to York from King's Cross, but by chance looking on the National Express East Coast website, saw that overhead lines were down in the Grantham area and passengers for Leeds and York should go on East Midlands trains from St Pancras and change to a Cross Country ttrain to get to York. So I left about half an hour earlier than I was going to and duly managed to get on the 5.55pm train to Sheffield at St Pancras. It was busy but not full and when the guard checked my ticket soon after leaving he didn't say a word. At Sheffield I only had to wait five minutes before a Trans Pennine train came in going to Doncaster. However at Doncaster it was a different story. Most trains going north from Kings Cross were about two hours behind schedule. It meant a forty five minute wait before I was able to get Cross Country train going to Newcastle from Bristol? There were two trains scheduled for both Glasgow and Newcastle but these were behind the train I got. So I eventually got into York just before 10.00pm, about 1 ½ hours later than scheduled. 4/9/09 York to Leeds via Harrogate. Leeds to Ilkley. Ilkley to Guisley. Guisley to Bradford Forster Square. Bradford Forster Square to Shipley. Shipley to Keighley. Keighley to Heysham Port via Lancaaster. Heysham Port to Lancaster. Lancaster to Preston. Preston to Kirkham & Wesham. Kirkham & Wesham to Blackpool South. Blackpool North to Preston. Preston to Lancaster. Lancaster to Bare Lane. Had to get up early at 6.15 to get the first train of the day from York to Leeds via Harrogate, It wasn't signed for Leeds but for Burely Park, the station before Leeds, just in case any passengers thought they were getting the fast train to Leeds. I felt sorry for the guard because the train was made up of six carriages, but the first two were shut, being taken as empty stock as far as Harrogate. At every station he had to shout out up the platform to all the passengers pressing the doors that those carriages were not in use! By the time we got to Leeds the train was standing room only with so many commutes getting on. The journey to Ilkley was quite pleasant though I thought Bradford Forster Square was a bit characterless. Shipley station was interesting, being the only triangular station in existence - anyone out there know any different? Changed trains at Keighley so able to see an observation car on the Keighley & Worth Valley Railway and also but some refreshments for my journey from their refreshment kiosk. The journey from Settle Junction to Carnforth was lost done by me back in 1971. It hadn't changed that much, including the rails which have never been welded, so it was a a very bumpy journey. Going to Heysham Port was a first. I missed out going there in September 2007 on a rail excursion which reached Morecambe, but wasn't allowed to go any further. So I stayed on the train from Leeds which is the only train of the day to reach the port, though on Sundays there are two for some reason!. It's a weird station as cars pass through the station building on their way into the port! After checking into my hotel in Lancaster and doing the job I had come up north to do, I went down to Preston on my Lancashire Day Ranger ticket and then went over to Blackpool, another place which I hadn't visited by train since 1971. 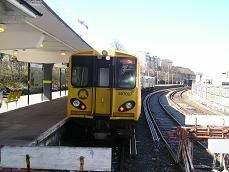 I went into Blackpool South on a typical Northern past it's sell by date, Pacer and came back after a tram ride, from Blackpool North. I was surprised to see semaphone signals at Blackpool North, which is such a busy station with holiday makers and day trippers all year round. I also think it's on of the biggest towns in England without a direct train service to London. Finally, I went back to Morecambe getting off at Bare Lane to see the Morecambe - Rochdale match, which was an entertaining 3-3 draw. rather than hanging around for half an hour after the game, i caught a bus back to Lancaster after a very busy railway day. 5/9/09 Lancaster to Preston. Preston to Halifax. Halifax to Wakefield Kirkgate via Huddersfield. Wakefield Kirkgate to Barnsley. Barnsley to Penistone. Penistone to Meadowhall. 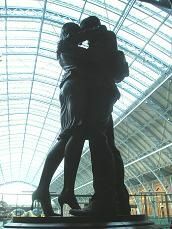 Sheffield to London St Pancras. London Fenchurch Street to Leigh-on-Sea. Up a little later at 8 o'clock today to catch the 08.26 to Preston and then a Trans Pennine train to Halifax, where my connection was waiting across the island platform. This would take me via a reversal at Huddersfield to Wakefield Kirkgate. I would have stayed on to Wakefield Westgate, but as I was catching another train from Wakefield Kirkgate in just over twenty minutes, I decided not to risk the walk or even run from Westgate station. On the way to Wakefield I finally passed Healey Mills yard, which for me in the early 1970's was a bit of a holy grail, with all the Class 37's allocated there. How times have changed with it being reduced to load of rusting sidings full of rusting and graffiti covered locos and wagons. Wakefield Kirkgate station wasn't much better, being possibly the most run down city centre station on Britain's railways. Although it had some CCTV cameras, it didn't have any electronic display boards, or even a ticket office, yet it wasn't that far from the town centre of Wakefield. The platforms and tracks had weeds growing from them and the station looked very neglected indeed. Getting a train down to Barnsley was different story. Barnsley station has been completely rebuilt and is integrated into the bus station as a transport interchange. There's even some mice sculptures of "passengers" on one of the platforms. I then made a quick visit to Penistone to see the eastern remains of the Woodhead route, which is now part of the Pennine Way. 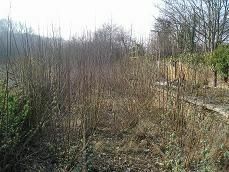 You can still see the old Woodhead platforms all overgrown in situ. It was a nice journey up into the hills and I will come back soon to go to all the way to Huddersfield on a quite picturesque line. The train back down to Barnsley and then Sheffield was woefully oversubscribed with standing room only in the two carriages as far as Meadowhall, where I got off. I then took a tram to the Don Valley Stadium, where I saw Rotherham beat Chesterfield 3-1 in a local derby, before getting a tram into Sheffield and taking the 16.27 to St Pancras. A load of Chesterfield fans got on the train, just before it left but they all went in another carriage so no problems there. 8/9/09 - Leigh-on-Sea to London Fenchurch Street and return. Farringdon to Luton and return. Had to go up to Luton with my work. Got a fast train from Moorgate up there and a slow, stopping one back. There's a new footbridge and exit/entrance been built at Farringdon. 22/9/09 - Leigh-on-Sea to London Fenchurch Street. Moorgate to Finsbury Park. Finsbury Park to Kings Cross. Liverpool Street to Leigh-on-Sea. Went to see Arsenal versus West Bromwich Albion in the 3rdround of the League Cup. My first visit to the Emirates and I was suitably impressed with the place. I don't understand though why so many fans queue up for ages at Arsenal tube station when they can walk a little further down the road to Finsbury Park and get a much quicker and emptier train to King's Cross. 23/9/09 Leigh-on-Sea to London Fenchurch Street and return. London Euston to Birmingham New Street and return. Birmingham New Street to Sutton Coalfield and return. Had to go up to Sutton Coalfield on business, so my boss paid for me to go by train rather than drive up there. Virgin Trains had actually got my request for facing seats with a table right for once! I did feel a bit sick on the way up though. Could it be that I am starting to react to the tilting of the Pendilinos? On the way back it was nice to have someone come down the aisle with a refreshment tray. I know that National Express East Coast do it, but this was the first time I had come across it on a Virgin Train. 29/9/09 Leigh-on-Sea to London Fenchurch Street. London Waterloo to Brentford and return. West Ham to Leigh-on-Sea. Went to the Brentford vs Southend United football match. 2-1 to Brentford with a penalty in the 90thminute to Brentford. Seemed to take ages from Waterloo to Brentford with the train stopping at every possible station. 3/10/09 - Rayleigh to London Liverpool Street and return. Went up to London to see Mott The Hoople at Hammersmith. For the first time in several years went on the Southend Victoria line from Rayleigh. A pleasant change to the c2c line and pretty quick. 7/10/09 - Leigh-on-Sea to London Fenchurch Street and return. West Brompton to Clapham Junction. Clapham Junction to Epsom. Epsom to London Waterloo. Had to go to Epsom once again with my work. Was going to go on the one train a day from Kensington Olympia to Wandsworth Road, but due to time constraints, got off at West Brompton, expecting to pick up the train here, but not on the departure board, then it came hurtling through the station! So will try again in November. 15/10/09 Leigh-on-Sea to London Fenchurch Street. London Kings Cross to Wakefield Westgate. Wakefield Westgate to Wakefield Kirkgate. Wakefield Kirkgate to Castleford. Castleford to Knottingley. Knottingley to Wakefield Kirkgate. Wakefield Kirkgate to Mirfield. Mirfield to Sowerby Bridge. Sowerby Bridge to Hebden Bridge. Hebden Bridge to Leeds via Brighouse. Leeds to York. Went up to York today, but via some of the minor lines around Wakefield, that I didn't have time to visit last month. As usual at Kings Cross the seat I was given in coach F was facing backwards and without a table. I walked up the platform to coach A where I was able to get a table seat facing the way the train was going and in a nice Quiet coach, unlike the carriage I was in from Leigh to Fenchurch Street, where people's mobile phones were ringing every few minutes! Saw an Adelante going south at Peterborough and saw both Grand central trains, which I don't usually see. At Doncaster there seemed to be a lot of train spotters about. Maybe a special was due past or perhaps the RCTS were having an observation day there? Got off at Wakefield Westgate OK and bought a West Yorkshire Train Day Rover ticket for just £5.30. As I was waiting for my train a Cross Country train going all the way to Penzance came in. As I was daydreaming about that journey and what time it would eventually arrive in Penzance, I didn't notice that my train to Wakefield Kirkgate had come in on the other platform! I rushed up the stairs and to he other side, only just making it with about ten seconds to spare! At Kirkgate I had a wait of seventeen minutes, so I went out of the station to the shops nearby and bought a bottle of water. Then went back to possibly the worst "big" station on the rail network. The good news is that since last month I have read that money is going to be spent on upgrading the station. I hope that they put in new roofs, a ticket office, cafe, waiting room, toilets and electronic signs and then it will be on a par with Westgate station! Architecturally it's a nice building, but has been left to rot over the past few years. They do have station announcements, like "The train now approaching platform 1......", but they are mistimed and actually happen about five minutes before the train comes in! Anyway onto Castleford, which I had last passed through in the early 70's on the way from Leeds to Hull. I had about twenty minutes here and walked into thee town and found a charity shop where I snapped up a book for the bargain price of £2.50, the only problem being its weight! Then onto Knottingley where I quickly walked over to the depot, which used to be a thriving place in the 70's and 80's but now is quite small. Still two coal trains passed through in the fifteen minutes I was there. Then back to Wakefield and onto Mirfield, where I had a wait of fifty minutes before getting a train to Sowerby Bridge to cover some more new track. I walked into the town and passed two cafes that were closing. Must have seen me coming! Luckily there was a third still open, by the name of "Cafe Boo" - I kid you not, where I had a nice cup of tea (or three) and a slice of home-made chocolate cake to refresh me. At Sowerby Bridge I thought I had a twenty minute break before my train to Leeds was due at 17.19, so I went into the newly opened Jubilee refreshment rooms. It's actually the old station building and has plenty of real ales on tap, so I tried one from the Greenfield brewery. As I was drinking this, a train came in on the other platform with Leeds as its destination. As there were no electronic display boards I didn't know that it was the train I should have been getting and it was 1709 and not 17.19 as I thought. The next one to Leeds wasn't until 17.50, so I could decide to stay in the bar and drink more real ale, or go on a train to Hebden Bridge and then catch the train there, where the wait wouldn't be so long. I chose the latter and was glad I did as Hebden Bridge must rank as one of my favourite stations on the railway network, with it's "back in time" decor. It even has a signal box just outside the station, even though there are electronic signals there! One of the waiting rooms with all the pictures of trains on the walls was sadly locked, even though the lights were on. However the one on the other side was open, with the heating on and a selection of magazines and books there for you to peruse, including some Real Ale ones from CAMRA. In spite of the fact that my train was delayed by a good few minutes, that waiting room helped to make the delay less painful. At Leeds I only had to wait about two minutes before my train to York came in. So I arrived in Yok about an hour late than planned, but still a nice diversion at the two "Bridge" stations! 16/10/09 York to Middlesbrough. Middlesbrough to Sunderland. Sunderland to South Hylton and return. Sunderland to Pelaw. Pelaw to South Shields. South Shields to South Gosforth. South Gosforth to Airport. Airport to Callerton Parkway. Back in the North East again after almost exactly a year. Got the 09.26 Trans Pennine Express from York to Middlesbrough, though the station indicator board knew something that we passengers didn't. It was displaying "train arrived", when it wasn't even in sight of York station! Then finding my seat reservation slip was another test of endurance. The number on my ticket led me to a slip that said reserved from Manchester to Thornaby! Another passenger was having the same problem and in the end we both sat in unreserved seats seeing as the train was pretty empty and my "reserved seat" was facing backwards. After completing my job in Middlesbrough I took the 12.32 Northern train up to Sunderland. It was only about a quarter full, and had tables which was nice. The view over the North Sea was spectacular after hartlepool, especially as it wasn't actually raining. 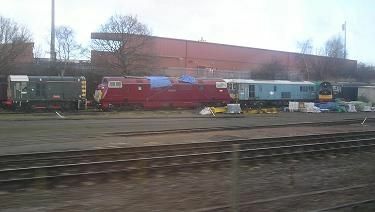 once again the Grand Central train went past my train just after Hartlepool. Arriving at Sunderland I realised why I had put this station as one of the worst in Britain. It's almost like a mini version of Birmingham New street, but much darker. 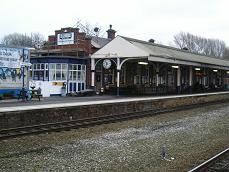 Plus only two of its four platforms were in use due to reconstruction work. As I was early for my next appointment, I took the Metro "train" - I wasn't sure if it was a tram, but the announcements said "train" - out to South Hyland and back. My ticket was great value for just £3.90 to be able to go anywhere on the Metro system, but bad marks to the ticket machine designers for not making them capable of accepting notes like most ticket machines on the railway network. I was forced to go outside a buy a cake at one of the many Greggs the Bakers shops which seem to be two a penny in Sunderland - along with pound shops. 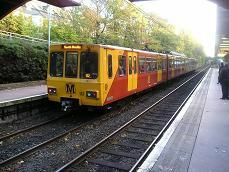 After completing my job in Sunderland I got a metro train almost straight away and travelled in the first carriage. After a couple of stops I was able to go in the seat at the front of the carriage, right next to the driver, who only gets half a cab, and watch the journey as if i was the driver. I haven't done this since I last went on the Docklands light Railway in London, so it was like being a schoolboy again getting a "cab ride" for free. I went as far as Pelaw and then changed trams. Got on a Metro train to South Shields. this time the four carriage train was pretty full, mainly with students coming home form college in Newcastle. After walking round the streets of South Shields trying Unsuccessfully to find a toilet and having a one sided conversation with a very friendly Geordie in the same predicament, who I didn't really understand what he was saying, I caught the next train out of South shields. I went as far as South Gosforth and again after a few stops was able to nab the front passenger seat. It was very interesting going in the underground section as at first you couldn't see a thing apart from the signal light ahead. then the driver put his lights onto full beam and you could see the darkened tunnel ahead. Very eerie. I was hoping to see a rat or even some weird subterranean creature, but it was all very clean and concrete. At South Gosforth I had a five minute wait, so I made use of the toilet cabin that is situated next to the platform. You put in 10p and then enter the Tardis, which is much bigger than conventional Pay as you go toilets in town centres. Finally I caught the train all the way to "Airport" or Newcastle Airport station to be precise. There was a good ten minute wait here until the rain went out again and I was able to travel to my hotel for the night. Met up with an old university friend who I hadn't seen for thirty years! Had a nice meal and a lot of reminiscing that night. After a pretty bad night's sleep - the bed was so hard, I got a Metro to South Gosforth and changed onto a train going eastwards to Whitley Bay. Was impressed with the architecture at both Monkseaton and Whitley Bay stations, which must have been pretty busy in their heyday. Got off the train at Whitley Bay and visited the sea front, before getting on another train and continuing to St James, where I briefly took some photos at Newcastle United's ground. Then went to Newcastle Central, where I was going to get a Northern train to Sunderland, b ut as they were only every hour and the last one had left a mere ten minuted ago, I had no choice but to get back on a Metro train to Sunderland. Then got another one to St peters, where I walked to the Stadium of Light to watch the Sunderland versus Liverpool match. Incidentally I touched that beach ball! 30/10/09 - Rayleigh to London Liverpool Street and return. A repeat of the journey I made on 3/10/09 when I went to see Mott The Hoople at Hammersmith. This time it was to see Barclay James Harvest and we only had to go as far as Euston Square. 17/11/09 Leigh-on-Sea to London Fenchurch Street and return. Had to go to Uxbridge with my work, so got a Metropolitan line train from Aldgate all the way there and back. It took about an hour. I was going to change at Harrow on the way back and get a Chilterns Line train into Marylebone, but decided not to. In the end it passed my tube train just as it was coming into Baker Street, so wouldn't have saved any time. 21/11/09 Leigh-on-Sea to London Fenchurch Street and return. London St Pancras to Derby and return. Derby to Burton-on-Trent and return. Went to see Burton Albion play Hereford United in the Division 2 of the Football League as part of my doing the 92 challenge. The only major problem was that the train from St Pancras wasn't due to arrive at St Pancras until ten minutes after it was due to leave! In the end it left about ten minutes late, causing the 12.00 to Corby to be delayed so we could have the path. It was nine minutes late arriving at Derby, so I had just a minute to get my Cross Country train to Burton, but luckily they held it for us and I didn't have to wait a whole hour for the next one. No problems coming back. 27/11/09 Leigh-on-Sea to London Fenchurch Street and return. London Victoria to Eastbourne. Eastbourne to Lewes. Uckfield to London Bridge. Had to go down to Eastbourne with my work, so rather than drive, took the train! Managed to get a Southern One Day Ranger for £10. All three trains on the way were delayed! My train to Fenchurch Street was 11 minutes late and the tube was held up for about five minutes at Mansion House. I was going to walk across the Thames to London Bridge and then go down to East Croydon catching my train from there. Instead I decided to catch the 09.47 from Victoria. Made it with five minutes to spare, but it was late coming in, due to signalling problems somewhere in South London. It didn't actually leave Victoria until 10.02 and went non-stop to Haywards Heath, meaning I would have missed it at East Croydon, so I made the correct choice. Coming back I got a train as far as Lewes, which is a lovely station and is a nice historical town. I then had a twenty minute wait for a bus to Uckfield. It only took twenty minutes, going right past the Lavender Line section of the original Uckfield to Lewes line which many would like to see reopened. At Uckfield, the bus arrived not long after the hourly train to London had departed. It was then a fifty minute wait for the next train out to London, so I browsed in a couple of bookshops, especially their train and football sections! Then it was a pleasant journey through East Sussex and Kent back into London along one of my favourite country branch lines. Had to go to Luton with my job and due to a shortage of trains had to wait about twenty minutes at St Pancras and well over half an hour at Luton coming back. Luton station came out in the top ten worst stations in Britain and I can see why. It was pretty cold and there was a waiting room on the platform I was waiting on, but it was locked and they didn't have the key! In the end I crossed over to another platform and found a different waiting room, which was unlocked. 11/12/09 Leigh-on-Sea to London Fenchurch Street. London Euston to Manchester Piccadilly. Manchester Piccadilly to Warrington Central. Warrington Central to Hunts Cross. Hunts Cross to Liverpool Central. Liverpool Lime Street to Huyton. Huyton to Wigan North Western. Wigan Wallgate to Kirkby. Kirkby to Liverpool Central. Liverpool Central to Chester. Start the day leaving Leigh just after eight o'clock and get to Euston in good time. As usual I've been given a ticket facing backwards, so move to a free seat opposite. The journey to Manchester and indeed all towns north of Rugby is so much quicker. It's now two hours seven minutes from London to Manchester, including stops at Macclesfield and Stockport. Though there is a price to pay, in that the Pendelino does suddenly jerk and lean over quite often, especially on the new track just south of Rugby. It's a bit like being in a Formula 1 racing car. No wonder some passengers start to feel sick! We arrive in Manchester a few minutes early so I am able to get an earlier train to Warrington than expected. I could go straight through to Lime Street and then come back to Hunts Cross, but decide to get off at Warrington Central and go round the shops, or the charity shops more precisely. I then get the 13.07 to Hunts Cross, where I change onto a Mersey rail train to go on new track into Liverpool Central. Not much to see though as it's mainly cuttings and tunnels. Walk round to Lime Street and take the 14.16 train as far as Huyton. I was going to buy a ticket there for my journey to Wigan, but the ticket office is closed and the signs says, pay on the train. By now it's quite foggy and you can't see much further than about 50 yards from the track. The guard doesn't come round so I get a free ride, especially as there are no barriers at Wigan North Western. I go round a few shops in Wigan before going to Wallgate station and taking the 15.52 to Kirkby, one of those crappy Sprinter units, which is only about a quarter full. The fog is even worse now and it's getting dark, so it's very difficult to see more than about ten yards from the window. At Kirkby you walk along the long platform, past two sets of buffers to wait for the Merseyrail train. The barriers have effectively cut this line in two, as they have at Ormskirk. I then go back into Liverpool and change at Central to get a train to Chester, but as it's now dark, you can't see that much. 12/12/09 Chester to Crewe. Crewe to Stoke-on-Trent. Stoke-on-Trent to London Euston. London Fenchurch Street to Leigh-on-Sea. Start the day at Chester station, where they are finally doing something about the awful Gents toilets I mentioned back in July. It's a Virgin train get as far as Crewe and it's actually seven minutes early coming into Chester. It leaves on time though. I'm amazed that the journey time from Chester to London is now just three minutes over the two hour mark. It used to be two hours twenty minutes when I was a teenager living there. At Crewe I change onto a single car East Midlands unit to get to Stoke. The line between Crewe and Kidsgrove I haven't been on since the seventies, and it's now single-track part of the way. It seems that they ruined many railways in Britain back in the eighties by doing this. Only now are they seeing the error of their ways and reverting some lines back to two. At Stoke I go to the Stoke versus Wigan match and then have an uneventful journey back to London and Leigh. 16/12/09 Leigh-on-Sea to London Fenchurch Street and return. London St Pancras International to Ashford International and return. Saw the publicity about South Eastern High Speed on the TV the other day and as I was coming into London to meet a friend for lunch, decided to go to Ashford and back before lunch as it is so quick. Caught the 10.12 from St Pancras to Ashford, cost £16.45 (with a travel card). There were no more than a handful of passengers on the train and it smelt like a new car inside, but it was a very pleasant journey, much more smooth than a Virgin Pendilino and bang on time going. The toilets had manual doors, which I found surprising as I thought all modern trains being built nowadays would have electronic doors. They did have plug sockets under each seat, which is a good addition. Coming back it was late leaving Ashford due to the platform being in use, and I was interviewed by someone from meridian TV about my views on the new service being late! We were about ten minutes late into St Pancras, but that was because of the platform problems at St Pancras. 18/12/09 Leigh-on-Sea to Southend Central and return. As it had snowed heavily in the night and I had to get into Southend, I took the train. Only £2.90 return and a train every ten minutes. Much better than by bus!